My posts on Indian Makeup and Beauty Blog - was a lot of fun, and thanks a lot, Rati, for the opportunity. TBS Organic Cotton Square pads - I use these for the Chizu Saeki lotion mask (review here). TBS Brazil Nut Define and No Frizz Cream (review here). TBS Bathing Gloves (review here). TBS Rainforest Haircare Range Promotion Gift Vouchers. A quick and easy alternative to powder eyeshadow, this fluid formula glides on for a long-lasting, lightweight veil of shimmering colour. Bi-phase liquid powder shakes to combine for subtle-to-intense shading, with stay-fresh, crease-resistant results. Released with the Les Tentations De Chanel Holiday 2010 collection, Splash is a limited edition shade - as are I think most of the shades released with this collection. Chanel's fluid iridescent shadows are biphase eyeshadows. eeis, as described earlier, a biphase eyeshadow. It comes in a glass bottle, a clear liquid on top and the pigments usually settled towards the lower half of the bottle. Shake the bottle to mix the two portions. The applicator is a supersoft doe-foot wand. Use it to apply directly on to eyelids or transfer on hand and use a brush or fingers to apply. Just remember to shake the bottle before use. Instructions on the Chanel site: Shake prior to use. Using built-in applicator, apply a small amount to the eyelid, lashline to crease. Using shadow/concealer brush and/or fingertips, gently blend for a delicate iridescent finish. Use in place of shadow base, if desired, for an intense result. Use to highlight the inner corner of the eye. I have read this colour described as "pewter." 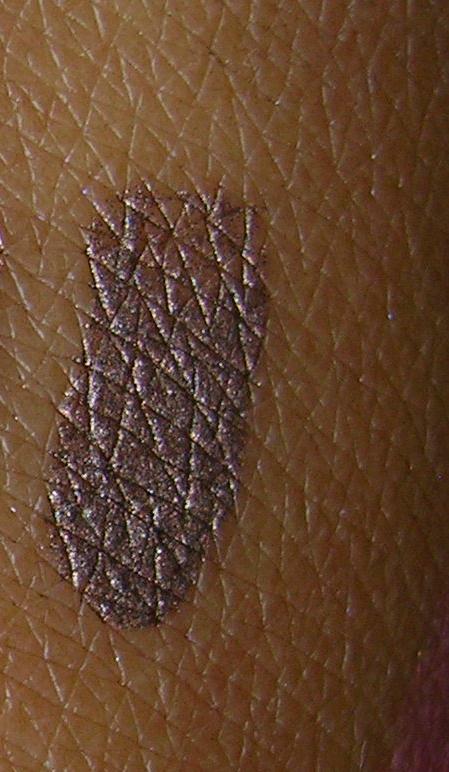 It seems like a brownish-greyish shade to me, with a sheen to it (not shimmer or glitter). It leans to the subtle side despite the sheen, subtle and I find it quite usable both in the day or at night. Under artificial lighting, the sheen is more obvious. Here's a look tried using this eyeshadow - used it all over my eyelid and lined near the upper lashline with a black liquid liner. 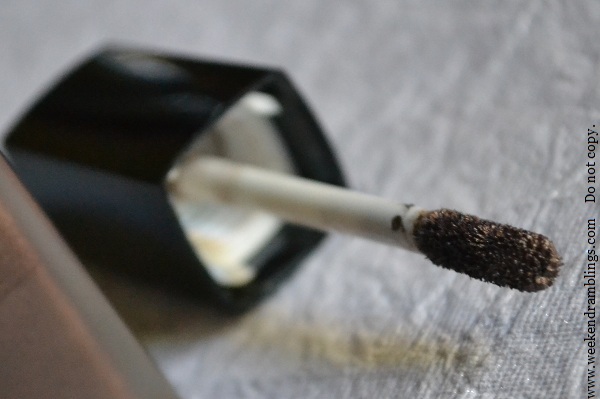 While not waterproof, the eyeshadow stays on a really long time without creasing. This is my go-to eyeshadow for most days since it is easy and fast to apply and is quite a neutral colour. 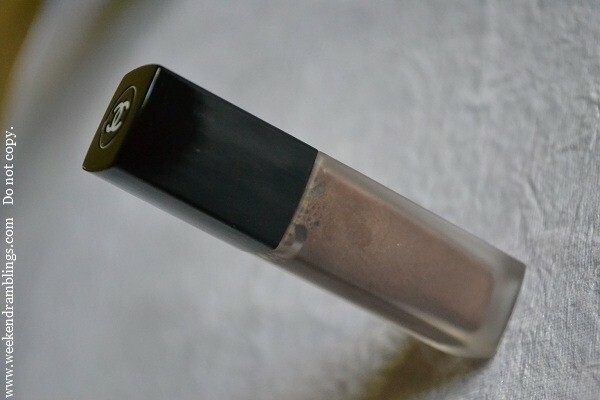 Unfortunately, it is a limited edition shade, and I do hope Chanel decides to repromote this gorgeous beauty some time. 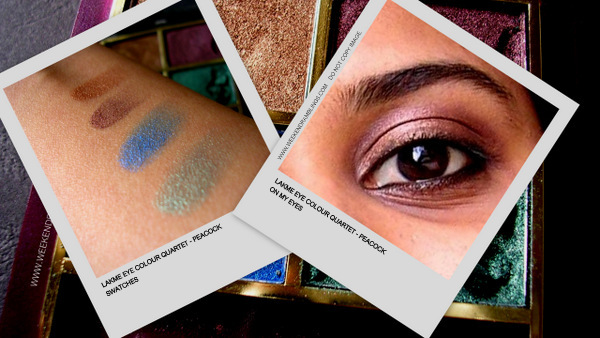 Lakme Eye Colour Quartet in Peacock: Versatile quartets of vivid, high intensity powders put together to color, shape and highlight your eyes like never before. I have heard a lot of people complain about Lakme eyeshadows, but maybe because I am very new to makeup and have not used that very many eyeshadows to compare this one with, I find the Lakm equads quite good. Seem pigmented enough to me, loads of colour with one swipe, do not fall off or fly around annoyingly. Another reason I like these are they are available just about everywhere and don't cost an arm, leg, finger, or anything else too exorbitant :D I think they cost around Rs. 400 but I bought it ages back and at a discounted price, so I could be very wrong. The one problem I do have is it is not very safe to travel with - mine broke, and this is the cleaned up version - but considering how badly some other eyeshadows seem to fare, I guess I cannot complain too much. 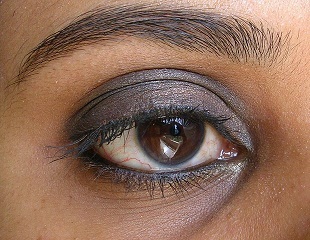 On my eyes, I have used only gold-bronze and maroonish-plum colour. Other products used: MaxFactor Kohl pencil in Black and Chanel Inimitable Mascara. This is the only Lakme eye shadow I have tried, and overall, I find it quite good - affordably priced and decent quality. Have you tried Lakme eye shadows? Do share! Inspired by the Chanel Rouge Allure lipsticks, the packaging of these glosses is the same black laquered case. They are much more pigmented than the regular Chanel glosses but are just as nonsticky. sufficient amount of gloss. I don't know what "flocked" is though! 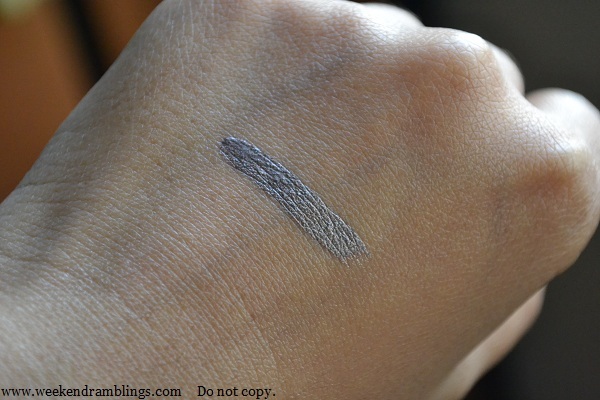 On my hand, I have swatched it sheerer on the left and more opaque on the right. What I like about this gloss is it can be used either way. If I use it sheer, it still gives good colour, and if I chose to use it more opaque, it does not look like I have dumped a whole lot of gloss on my lips. It just looks more pigmented and that's it. I absolutely hate it if it looks like its going to drip off my lips any moment kinds...absolutely ewww! Have applied it slightly sheer. 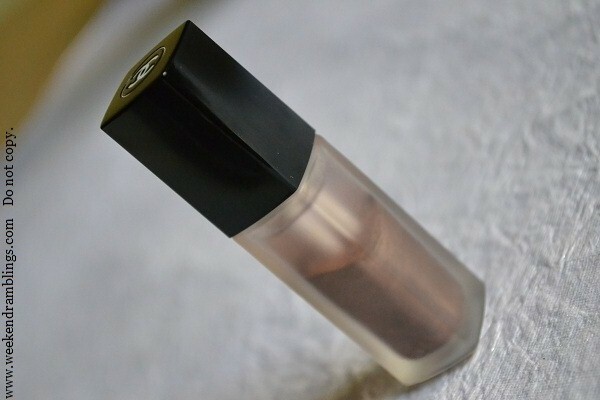 Nonsticky, generously pigmented, and very classy packagining, this gloss is an absolute must-try from Chanel. Chanel has another product, Rouge Allure Laque, and if you are a lipstick person, then that maybe a better choice - I think of those as liquid lipsticks :) For a lipgloss lover, though, Rouge Allure Extrait De Gloss are the best best best glosses ever. Is very scary bright in the bottle, but its a gloss, and a very sheer one at that :D My lips are very unevenly pigmented, and I really couldn't get a proper pic for a lip-swatch, honestly don't think the colour that shows up in the pic would be what it would look like on the lips. This is the swatch on my hand. 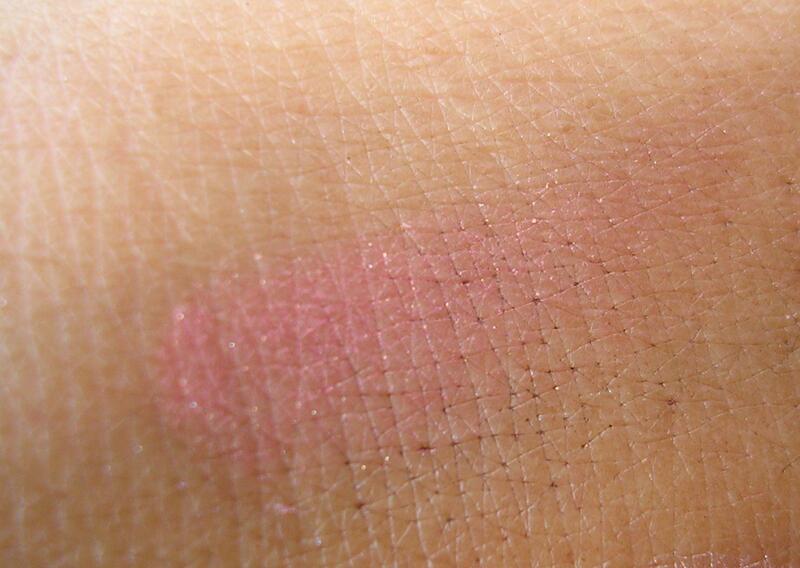 And this is the highly unreliable lip swatch. I would use this only with a lip liner, but I have taken the pic without one because the colour really wouldn't be the actual gloss colour, otherwise. 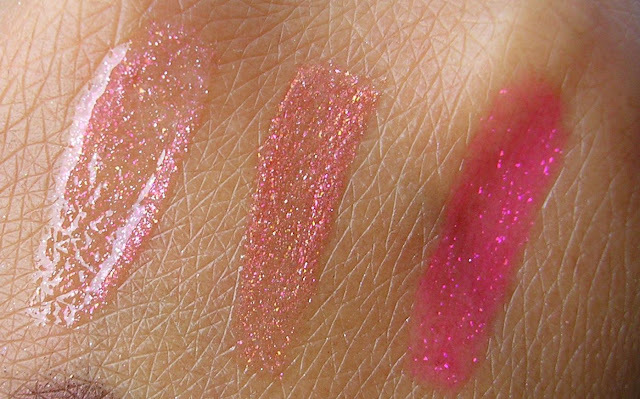 This gloss is a very reddish-pink with very fine gold shimmer in it. The shimmer was nonexistent, though, on my lips. Is just not seen AT ALL. It gives a very faint reddish-pink tint to the lips colourwise and of course is glossy. Is a very very sheer colour. Its a bright beautiful colour in the bottle but on the lips, you get hardly anything. Just a faint tint of the colour. I did not find it anything special. The main reason I will never buy this again is: I HATE THE SMELL/TASTE which I get when I put this on my lips. I did not try this on my lips before I bought it, so I have only myself to blame, but I would strongly recommend anybody planning on buying this to do smell it before you buy, and definitely apply it on your lips before buying. My final take on this gloss: This is a shade I do not have and it is nonsticky, add to it the nice wand, I do not regret buying it at all, but I will not be buying any other colour in this range. And this was the easiest way to claim I used red :D I will have to learn to tolerate the smell/taste, though.....really, what is it??????? I used the coppery brownish - err..not the dark brown colour. And so, I went shopping today..
Got a Revlon lipliner free with this - is a dark brown colour - but that's what they are giving..
And then a veg. sandwich, Haagen Dazs Dulce Le Leche single serving miniature tub, some fruit yogurt, a baguette - I am quite clueless what to do with it, and a Mars bar...:D :D So, how was your lazy Sunday?? 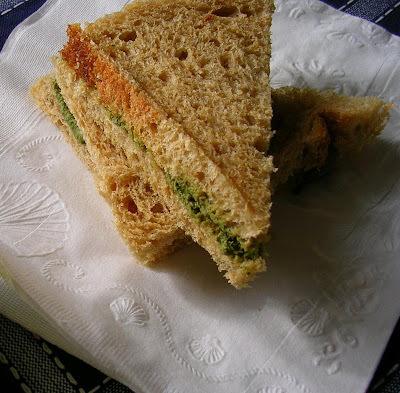 Crust from 4 slices of bread +1 slice bread from the end (the brown crust one) - chop this into cubes roughly. If using bread slices, I guess around 3 slices of bread. Don't use fresh, soft bread for this EVER. A few curry leaves - optional, if you don't have it or are clueless as to what it is. Green chili - 1 (I am a baby, I use one, adjust to your taste) - finely chopped or if you are a baby slit lengthwise, is easier to fish out. Potato - 1 medium potato - boiled, cut into cubes - I just rough chop/mash and add. A note on the optionals: You put these in, the "upma" tastes better. The more ingredients you skip, the closer you are getting to just eating stale bread and boiled potato. Heat a bit of oil in a skillet/kadai/some vessel - no, not a tawa. When oil gets a bit hot, add mustard/jeera seeds (if using) - wait for this to go cackle-crackle-sizzle-sputter - shouldn't take much time. Add green chili, cashew/peanut if using, and curry leaves (if using). Saute a bit, and add onions. Saute for about 3 min, until they go a bit pinkish and translucent. Add the boiled potato, salt to taste, and saute a bit..maybe 5 min. Add the bread pieces, add curd, mix it all up quickly. Take care not to let the bread get soggy. Cover and keep on medium heat for about 5 min. Take the lid/cover off, mix again, add corriander for garnish if you want to. want an ugly mess like this one. Walnuts - a rich source of omega-3 essential fatty acids - good for the heart and have anti-inflammtory and antioxidant properties. Walnuts supposedly also provide a boost to the immune system and have anticancer properties. This very unattractive chutney is superyummy. And an easy way to eat healthy. The Clinique 3-step program is pretty well known to most skincare/beauty addicts, but I was ignorant about its existence until recently, so for anyone like me, here's a short bit. Clinique classifies skin types into 4 types (I think) based on some simple questions and some looking-at-skin-through-huge-glass tests. Based on the results, Clinique recommends a 3-step program of cleansing, toningexfoliating, and moisturizing. 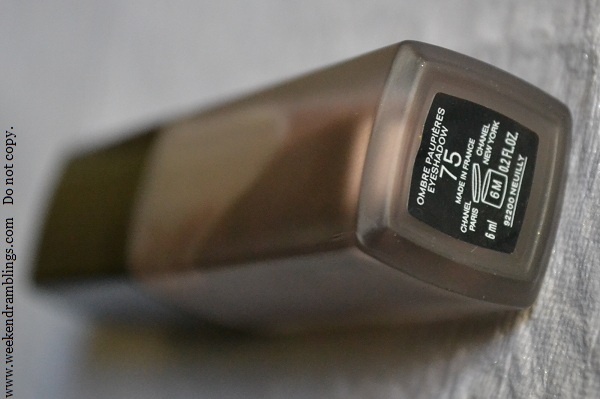 The Clinique skin testing puts my skin type at a type 3 - Combination-oily. I was given a sample kit of the type 3 products which included the Clarifying Lotion 3. Clinique consultants will inform you a million times that this is not a "toner." These are "clarifying lotions" which are "exfoliators," and they remove the dead skin and dirt that lie on the skin surface and give you cleaner healthier skin. I found the strong strong strong nail polish remover smell of the Clinique type 3 clarifying lotion quite unbearable. It works amazingly well, though, at clearing up any oilies, so I would recommend it to anyone who has really oily skin. I found it a bit drying for my skin, and I never went back to Clinique for a long time. Recently, I decided to pick up the Clinique Clarifying Lotion type 2, and I am much happier with this one. This one too has a strong smell - maybe a bit less than the type 3. Has a minty refreshing feel to it - which I am actually errr beginning to like. It leaves a cooling effect on the face for a bit of time and it feels good. Ingredients: Water, alcohol denat., witch hazel, glycerin, menthol, sodium bicarbonate, ext. violet 2. And right after I spend a good hour searching for ingredients list online, I find this label stuck at the bottom of the bottle! Take some product on a cotton round and wipe face with this. Avoid the area around your eyes. Now, I just cannot bring myself to say its good to use alcohol-based products....but errr...I am using it, it works great at keeping the oilies away, and errr..what is worse I will still continue to use this, I think. I am finding this quite useful. A few months back I was totally against alcohol-based toners, but I am beginning to realize that for me at least, my skin care is going to be a lot about compromising and adjusting and using a combination of products depending on what my fickle-minded skin decides it wants to be. For now, I am using this on most days of the week and use the Shiseido softener on other days or in the night. This combination is working good for me right now, so that's how I will be continuing. Normal-skin people and the lucky humans with no acne, I would not really recommend an alcohol-based toner, but you could use this maybe maybe maybe once a week to give you squeaky clean skin. Anybody with sensitive skins - try it at the store before buying or ask for a sample bottle if available. I did not have any problem with it, but skin reactions vary from person to person.